The calculations are complete. 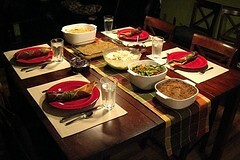 Total cost per person for our Thanksgiving meal (one generous serving each of six dishes and two desserts): $3.50. Note that I didn’t skimp on quality of ingredients — I used such expensive items as pine nuts, heavy cream, whole vanilla beans, and real maple syrup. I also did nothing different from my usual shopping habits here — although we don’t usually eat this much, we do eat this well, and this cheaply, all the time. With only two people eating meat, cooking a turkey seemed like a waste. 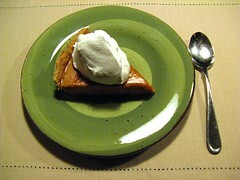 Jak said he wouldn’t miss turkey so long as we had cornbread dressing and pumpkin pie. So I decided to make an entirely vegetarian meal. That means you could serve this meal plus turkey to ten people for under $40. What isn’t included: energy cost to run the oven, microwave, and so forth. Butane for the creme brulée torch. Water from the tap. Everything else is accounted for, including the cost of items I already had in the pantry. Below is the menu and the cost breakdown by dish (you can see the first six on this plate, clockwise from top; desserts are separate). Where applicable, I have linked to recipes, with the following caveat: I almost never follow recipes exactly as written, so I may have made liberal adjustments. NEW: I’ve ported my spreadsheet over to Google Docs, so you can see the breakdown of cost by ingredient. Made this one up on the fly: mashed sweet potatoes flavored with butter, maple syrup, nutmeg, cinnamon, and allspice, covered with a streusel made from ground pecans, flour, butter, sugar, and cinnamon. (Pecans and real maple syrup account for 57% of the cost.) My only regret is that the streusel made it brown instead of vibrant orange; I wish I’d had a clear dish to bake it in. 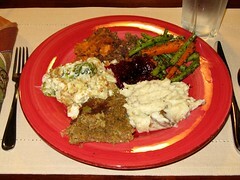 I was seduced by the gorgeous photo on Kalyn’s blog into trying this for Thanksgiving. The charmoula sauce is an amazing discovery. I am going to be putting it on everything now. It was crazy-awesome. No recipe here — just roast a huge wad of garlic cloves in olive oil in the oven, then mash and add to potatoes along with generous amounts of butter, cream, and salt. Potatoes are so cheap that even with the dairy this is still a bargain. This is a permutation of the cornbread dressing I grew up with in Texas. First you make homemade cornbread, then crumble and rebake with sauteed celery and onions, eggs, milk, broth, and poultry seasoning. Not the most attractive dish in the world (especially since I used whole wheat flour in the cornbread, making it darker) but yummy all the same. I’ve been running variations on this Epicurious recipe for about a year now, to universal acclaim. Usually I make it with just the cauliflower, but this time I wanted a second green vegetable on the table, so included Brussels sprouts — albeit not in the proportions of the original recipe. Classic fresh cranberries + simple syrup, flavored with allspice, cardamom, and ginger. This was Jak’s contribution to the meal. He doesn’t normally cook at all. 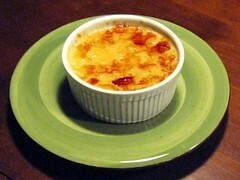 But he loves creme brulée and so a few years back I got him a torch set and a creme brulée cookbook for Christmas, in hopes that he would be tempted. Well, it finally paid off. This is the other relatively expensive dish, but like the gratin completely worth it. He picked this Martha Stewart version for his first attempt, and I’d say it was a tie with the best restaurant creme brulée I’ve ever had. What a fantastic vegetarian dinner! And what a wonderful idea. I’ve been decrying the horrible expense of feeding a family a holiday meal, even without the turkey, which I haven’t had for sixteen years! This is a great solution, and a big move forward in holiday simplicity. Thank you! You’re welcome, Bridget! If you have any questions, I’m happy to clarify details. Fantastic! I kind of want to say more but that pretty much sums it up, so I will say it again.